Vikas Swarup ‏@MEAIndia: On day 2, discussions move on to “More Effective & Efficient Global Eco & Fin. Governance”.PM begins intervention. Why a stable global economic and financial system is imperative for growth. PM emphasises:Long-delayed 15th General Review of Quotas must be completed by 2017 Annual Meetings. We need a regular dialogue between the IMF, Regional Financial Arrangements and Bilateral Swap Arrangements. Fighting corruption,black money & tax evasion central to effective financial governance. 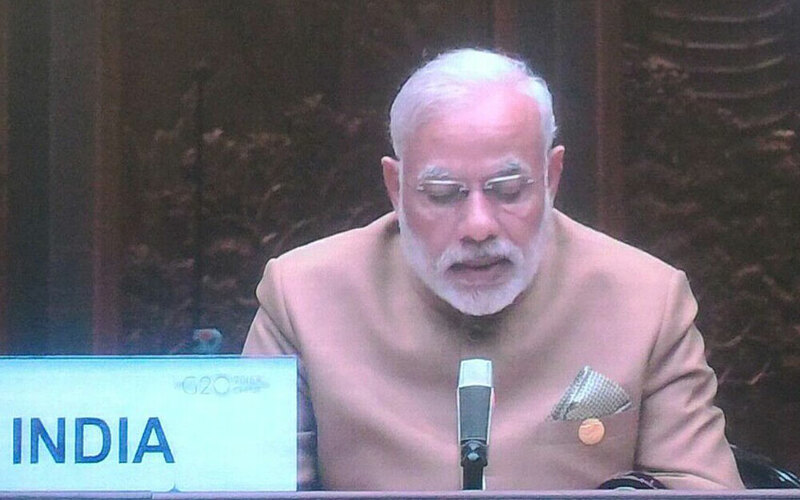 PM professes India’s support for BEPS recommendations and calls on countries to commit to the timeline of 2017-2018. G20’s efforts shud b for zero tolerance fr corrp’n &black money;zero admin,policy &treaty loopholes;zero barriers &full cmtmnt to action. The vision of transparent,equitable,non-discriminatory, open, inclusive & rule-based global trading arch. should underpin collective efforts. Trade facilitation is important. I urge countries to fully implement the Bali and Nairobi Ministerial decisions. The global trading regime must respond to needs & priorities of developing nations. Global value chains must provide them level playing field. Knowledge & innov’n driven economy requires free mobility.India’s priority is to work towards Trade Facilitation Agreement for Services. G20 needs to act to stimulate investment flows. Transformed & liberalized investment regime has put India among top host nations for FDI. PM Narendra Modi also met Indian Students at Hangzhou, China. Those who all volunteering as interpreters at the G20 Summit.